We are often told not to trade against the trend as that decreases our odds of success. In order to increase our success, we must then understand what the current trend is in order to predict future ones. 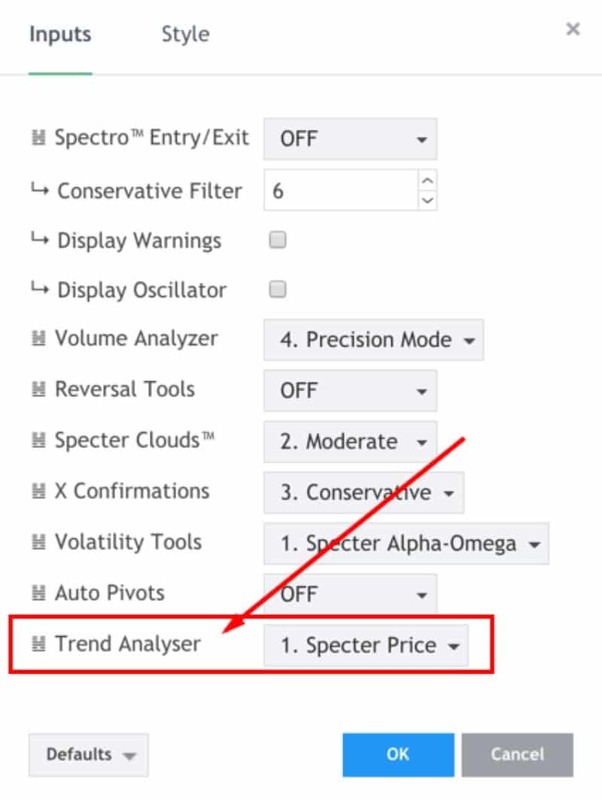 Spectro offers several different tools to help analyze the trend. This will allow you to easily see the major market trends without the need to have on extra longer chart to look at for trend confirmation. With this tool, you can cover a fundamental piece of trading faster and easier. Green areas are bullish, red areas are bearish, and orange areas are transition areas, often, the orange areas forecast a substantial price move. This mode requires a LOT of past data to work since it’s not time-based, it’s priced based. So if the asset doesn’t have a lot of past information you might see some blank data. Therefore in larger timeframes, you might experience no data on older periods. If that happens it means the asset doesn’t have enough data for processing. Specter Volume analyzes the trend based off of cumulative volume. This gives an overall picture of volume changes. When areas get choppy, you can see a directional shift taking place. The Smart Trend line is created to remove excessive noises so that you can focus on the main trend. It tries to forecast the trend. Green forecasts bullish movement and red forecasts bearish movement. Occasionally, you will see the trend line stop. This means that the current trend line is broken and a new trend is forming. The Cumulative Mode is based on volume, price, and price change. It provides a bigger picture of what is going on. It gives you warnings when the trend is about to change. The overall color in an area will indicate the main trend. When you start to see the colors change, it is giving you warnings that the trend is shifting. Ehlers Mode is based on Ehlers’ MAMA/FAMA model. It takes into consideration the price and price change. It does very well clearing out the noise so that you can just focus on the overall trend.